KEF Q300 review | What Hi-Fi? It's sobering to think, particularly for those of us who remember the launch of the originals, that these Q300 standmounters form part of KEF's eighth generation of Q Series loudspeakers. This latest iteration sees some fundamental changes over the superseded range, the most obvious of which is the switch from elegantly curved cabinets to capacity-boosting but altogether more humdrum-looking straight-edged boxes. But thanks to the appearance of the Uni-Q driver arrangement, it's obvious that these could only be a KEF design. These are generously proportioned speakers, slightly bigger in every direction than the B&W 685s: it follows that they will require decent, dedicated speaker stands to give of their best. There’s a wall-mount bracket on the back, but use those and you won’t do yourself (or the sound) any favours. You’ll also want to position them away from the wall: that sizeable reflex port may be at the front, but the Q300s demand some free space. The chromed strip running almost the entire width of the front baffle is a cheerfully retro flourish, and the new biwire speaker terminal arrangement is brilliant in its simplicity, but in other respects there's little to set the Q300s apart from the vinyl-wrapped (or, in this case, recycled wood-fibre-wrapped) herd. The highlight, however, is KEF’s Uni-Q driver design. A 25mm vented tweeter sits in the centre of a 165mm aluminium mid-bass unit. It’s a ‘point-source’ array that aims at better integration, with sound that appears to come from the same point in space. On top of this, ‘tangerine’ waveguides over the tweeter aim to maximise dispersion. It’s an intriguing design. Combined with the slightly retro silver band running across the front, the Q300s have a purposefully industrial look. How do they sound? The soundstage is full and expansive. There’s high level of separation that makes it easy to locate specific instruments, and yet the level of integration is such that everything works together instead of sticking out. Then there are the dynamics, which are perhaps the single most impressive thing about the Q300s. Stick on an orchestral version of Habañera from Bizet’s Carmen suite no. 2 and the jump from is-this-on silence to full-throttle loud is enough to knock you back in your chair. If you’re a bit of a thrill-seeker, this will bring a smile to your face. Combine the linear dynamic response with a good sense of timing, and the KEFs are engaging enough to make you wave your remote about like a baton. The Q300s also have a nice, no-fuss kind of competence. They’re as happy getting down and dirty in a club as they are tiptoeing around a concert hall. They’re eloquent in the midrange and pack plenty of low-end punch. Only where treble reproduction is concerned do the KEFs appear anything less than utterly confident and composed. It's crisp and sharp, but there’s a slightly thin and delicate quality to it. When it comes to system matching, be sure to choose an amplifier that isn’t too provocative at the top end. When it comes to balance, the Acoustic Energy 301s sound more natural. Meanwhile, the Q Acoustics Concept 20s’ soundstage is just as impressive, giving the KEFs a run for their money. 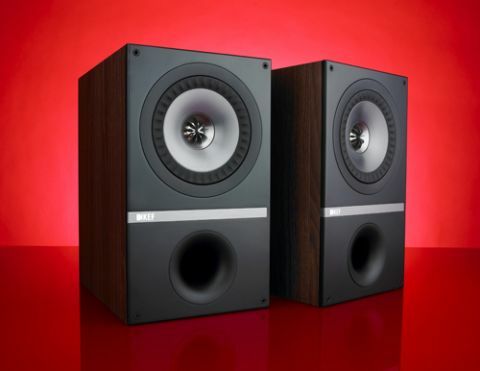 The KEF Q300s remain great speakers – they were, after all, our Speaker Product of the Year in 2011 – especially for bass quantity and far-reaching dynamics. But time moves on and the competition is even stronger than it was two years ago. Up against newer rivals such as the Q Acoustics Concept 20 (£350) and Acoustic Energy 301 (£425) the KEFs lost a star. At £450 they’re more expensive than their rivals, so make sure to hold a few auditions first.